Editor's Note: There are three images associated with this news release. 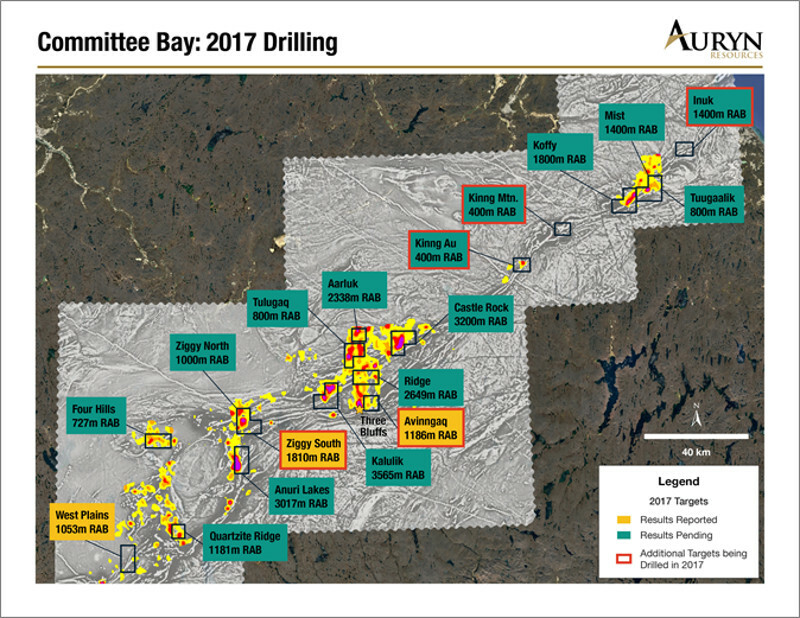 Auryn Resources Inc. (TSX:AUG)(NYSE AMERICAN:AUG)(NYSE MKT:AUG) ("Auryn" or the "Company") is pleased to announce initial results from its summer exploration drill program at the Committee Bay Gold Project located in Nunavut, Canada. The results represent 15% or 21 holes out of 148 holes currently drilled across 18 targets in the belt this summer (see Figure 1). Highlights include 9.15 meters of 3.48 g/t Au and 1.53 meters of 7.48 g/t Au which ended in mineralization where the hole was lost at West Plains. West Plains remains open at depth (See Figure 2). President and CEO, Shawn Wallace stated, "We are pleased with the results we have seen to date and the level of efficiency of the work completed this season. The Committee Bay summer program is a considerable undertaking both technically and logistically. We are looking very forward to receiving the results of the remaining 25,000 meters as we have tested the most robust targets on the belt that we have found to date." Mr. Wallace further stated, "This is an exciting time for Auryn shareholders as we enter a busy season of results from the Committee Bay and Homestake drill programs. Surface exploration is also currently underway in Peru ahead of drilling later this year." The RAB drill program undertaken this year was designed to test new target structures underneath till cover and to drill the source rock of gold-in-till anomalies and mineralized boulder trains. To date 15% of the results have been received, with the complete results from the West Plains, Ziggy South, and Avinngaq targets reported in Table 2 below. The summer exploration RAB drill program has approximately 25,000 meters in 127 holes remaining to be released in the coming months. 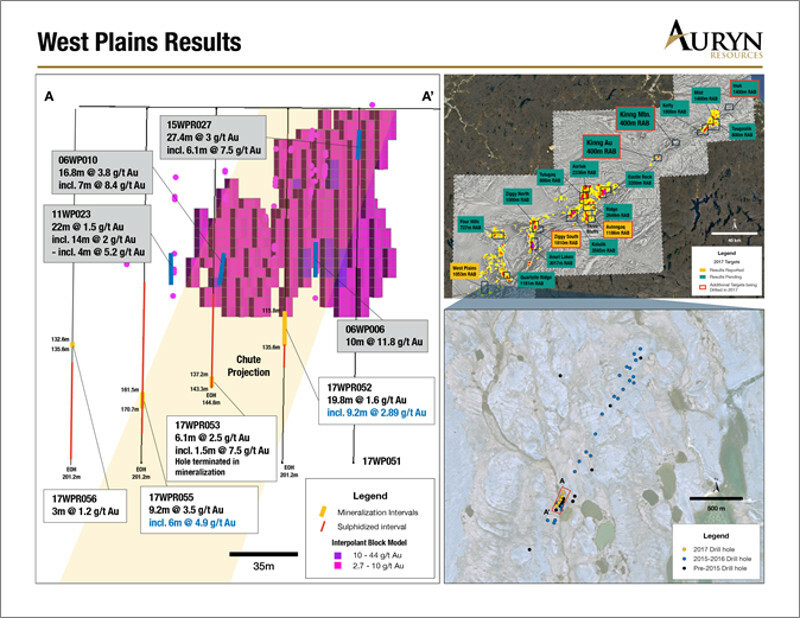 Michael Henrichsen, Chief Geologist and COO of Auryn commented, "Drilling at the West Plains target demonstrates that high-grade mineralization continues down plunge to a vertical depth of 150 meters. The West Plains target is considered an important target to explore to depth as the alteration associated with gold mineralization is very strong with widths of 40 to 80 meters of sulphidized banded iron formation being encountered." Mr. Henrichsen further stated, "We are very encouraged by several targets in the belt with pending assays where we successfully intersected highly sulphidized banded iron formation similar in nature to that of the Three Bluffs deposit." Results from both the Ziggy South and Avinngaq prospects encountered anomalous gold over narrow widths but are not deemed to be significant. * Hole terminated in mineralization. The five additional targets being drilled were identified by a combination of gold-in till-anomalies and outcropping mineralization. Of particular note are the Kinng Mountain and Kinng Gold targets in the northeast third of the belt (see Figure 3) where Auryn is currently drilling under high-grade surface mineralization in sulphidized banded iron formation. This surface mineralization is defined by historic grab samples, highlights of which are outlined in Table 2 below. This release includes certain statements that may be deemed "forward-looking statements". Forward-looking information is information that includes implied future performance and/or forecast information including information relating to, or associated with the acquisition and title to mineral concessions. These statements involve known and unknown risks, uncertainties and other factors which may cause actual results, performance or achievements of the Company to be materially different (either positively or negatively) from any future results, performance or achievements expressed or implied by such forward-looking statements. Readers should refer to the risks discussed in the Company's Annual Information Form and MD&A for the year ended December 31, 2016 and subsequent continuous disclosure filings with the Canadian Securities Administrators available at www.sedar.com and the Company's registration statement on Form 40-F filed with the United States Securities and Exchange Commission and available at www.sec.gov. 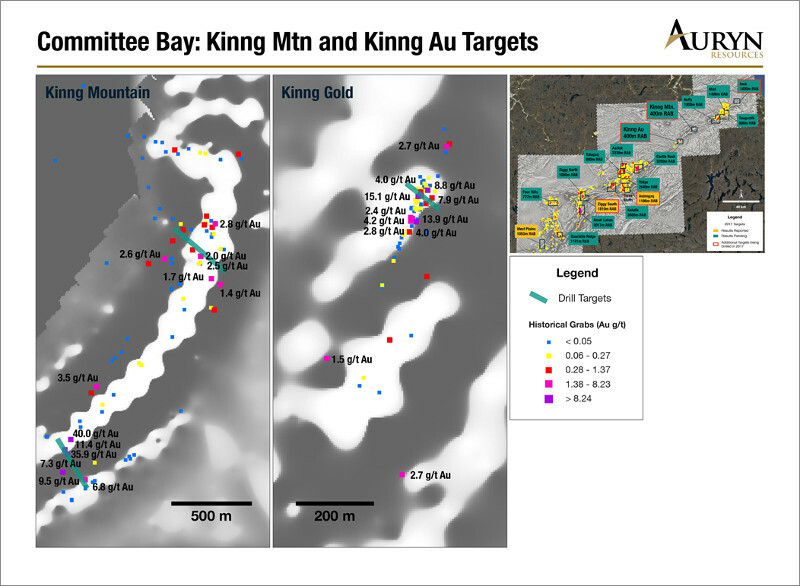 Figure 1: Illustrates the targets that have been drilled at the Committee Bay Gold project. Results that have been reported are highlighted by the yellow text boxes. Figure 2: Illustrates the results from the West Plains drilling in the Southwest region of the Committee Bay Gold project. The high-grade shoot has a vertical continuity to 150 meters depth and is open for expansion. Figure 3: Illustrates high grade historical grab samples at both Kinng Mountain and Kinng Gold targets.